Thinking about selling one of the rarest, most highly valuable precious metals – palladium? Be sure you’ve found the best expertise, here at NYCBullion. Our trained professionals will tell you everything you need to know about selling palladium. Come and visit us to receive a confident evaluation and get the best quote for your palladium bullion. You can feel completely secure when dealing with NYCBullion – we are specialized in all types of precious metals and jewelry and our mission is to make sure you will receive the most qualitative assessment of your palladium investments. NYC bullion is the best place to get cash for palladium in NYC! As one of the few buyers that exchange this rarest precious metal, we offer you the most transparent and trustworthy service in authenticating palladium bars, coins or jewelry. You can visit us and test your palladium bullion before selling it – our high-class experts will evaluate it right in front of you so that you will receive all the relevant details about your palladium investment. We strive to give you the best experience in exchanging palladium, for you to be completely satisfied with the assessment and to receive a generous cash payout. Where Can I Sell Palldium? Where Can I Sell Palladium? Are you searching for the most trustworthy buyer to sell palladium? NYCBullion is one of the few palladium metal buyers that offers you the best palladium selling experience. We are located in New York City’s heart, the Diamond District, in Manhattan. Forget about dealing with precious metal scammers – our skilled crew of precious metal professionals will assist you in any matters regarding your palladium bullion. Our jewelers will assess and authenticate your palladium investment with full transparency – simply visit our locations and get a fair cash payout for your palladium today. We are among the few palladium buyers that are buying palladium coins in a fully transparent manner and with high accuracy. Visit us and get cash for palladium at fair prices when selling your precious coins. We buy palladium bars only after you are fully satisfied with the assessment of your palladium ingots. We, as a reliable palladium buyer, guarantee that you will receive a top-notch evaluation and the most attractive offer for your palladium exchange. Or you are searching for the most trustworthy palladium buyer in New York to sell palladium scrap? If you’re selling palladium rings or selling palladium jewelry, NYCBullion has got your back! We will offer you the best price of scrap palladium available on the market so you can visit us and sell scrap palladium in no time! Selling palladium is no longer a problem. Visit our location in the heart of New York – the Diamond District – and get the best offer for your palladium bullion. When we buy palladium, we want to be sure that you are completely satisfied with what you get in return. This is why you can confidently sell palladium jewelry or any other palladium bullion by visiting us or contacting us online. Are you looking for where to sell your palladium ring in a pleasant and comfortable way? 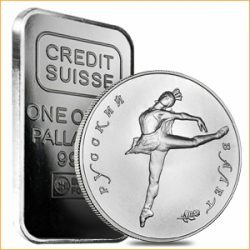 NYCBullion provides you a great experience when you sell palladium both online and in-store. If you want to get a professional look over your palladium bullion and be confident of its evaluation, just visit us in the Diamond District in NYC. Our experts are more than happy to provide you with all the necessary information when authenticating your palladium coins, bars, jewelry or palladium scrap. You can also sell palladium by accessing the “Get an offer now” form on our website to receive your personalized cash for palladium quote. Thinking about selling your scrap palladium? You will get the best scrap palladium price per gram here at NYCBullion. Our assistants in the Diamond District are more than happy to help you in authenticating your palladium scrap, according to highest standards. The examination is performed right in front of you, so you can be sure that you receive a complete evaluation of your palladium scrap, from industrial and medical to laboratory scrap. Simply visit or contact us to get your amazing quote for selling palladium here at NYC Bullion!